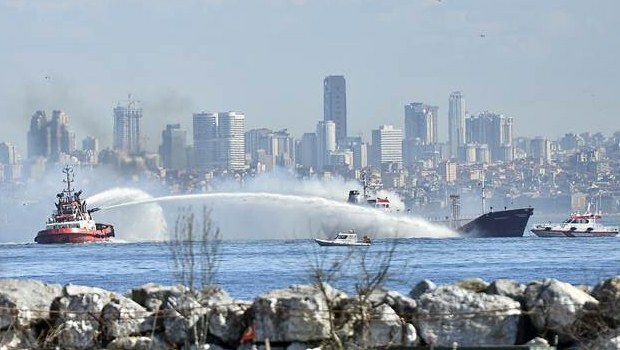 The 58 meter long, 598 dwt coastal tanker Yakamoz 5 caught fire while anchored in the Marmara Sea near Istanbul, Turkey. 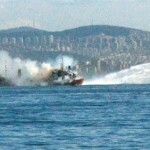 The fire started in the vessel’s engine room after an explosion. The blaze quickly spread through the superstructure. All six crew were evacuated from the vessel, but one crewman suffered injuries and was taken to hospital. Fire rescue vessels arrived on scene and brought the fire under control. Authorities are monitoring the situation for any pollution being released. The Yakamoz-5 had some 400 tons of fuel on board at the time. A 730 foot long container barge under the tow of the 538 gt tug Patriarch caught fire off Nassau, Bahamas. 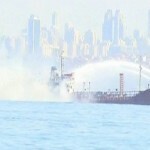 The fire started in one of the containers and continued to burn as the barge was unmanned. No reports of injuries. 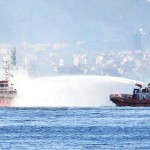 The vessels proceeded towards Nassau where authorities can deploy fire fighting efforts.